Today (November 17) is the first day of the Novena leading up to the feast day of the Founder of the Pauline Family, Blessed James Alberione, which we celebrate on November 26. 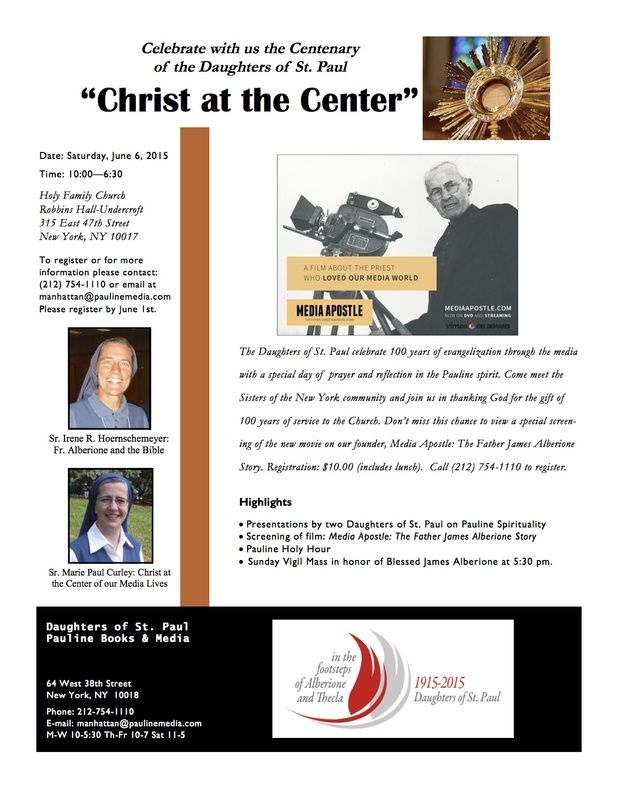 If you don’t know about this great media saint (still to be canonized), you are in for a treat! Two years ago, the novices of the Society of Saint Paul (the brother community to the Daughters of Saint Paul) created a series of images with quotations from Blessed James’ writings and preaching. I thought I’d share one each day of the novena. Blessed James Alberione (1884-1971), the Founder of the Pauline Family (five religious congregations, including the Daughters of Saint Paul, four secular institutes, and the lay association of Pauline Cooperators), was one of the most prophetic figures of the twentieth century. His prayerfulness and his insatiable desire to integrate faith, culture, and the needs of the person transformed this frail Italian priest into a visionary whose tireless and innovative efforts to bring Jesus Master, Way, Truth and Life to all of humanity continues to bear fruit today. 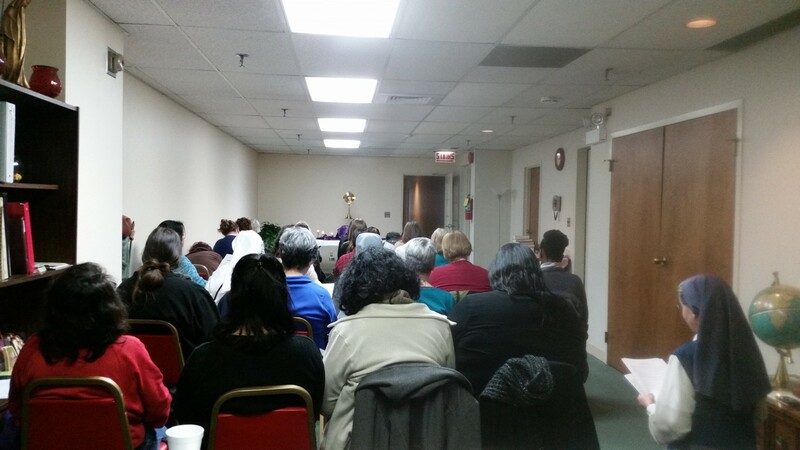 The first two religious congregations which Alberione founded–the Society of Saint Paul and the Daughters of Saint Paul–are dedicated to communicating the Gospel through the media. The Pauline Family has thousands of members worldwide, each of whom seek to live Christ as Saint Paul understood, lived, and communicated him. 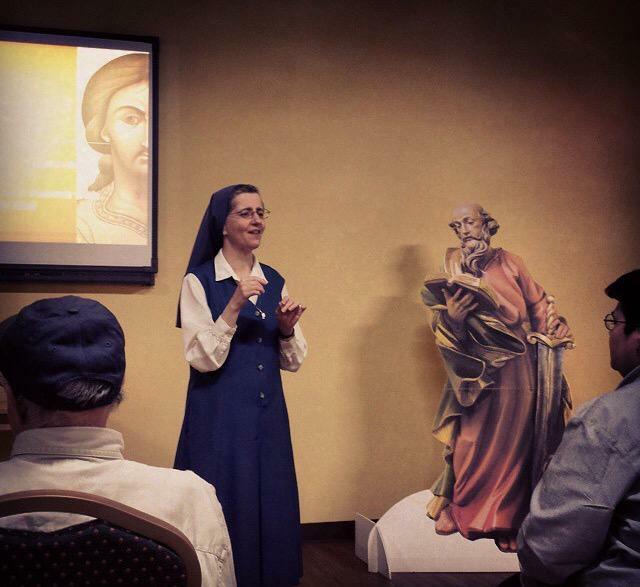 under the gaze of the Queen of Apostles…. The Pauline spirituality is, after the Pauline Family itself, perhaps the greatest treasure which Alberione has left, not only to his spiritual daughters and sons, but to any Christian who seeks to authentically engage with today’s communications culture. 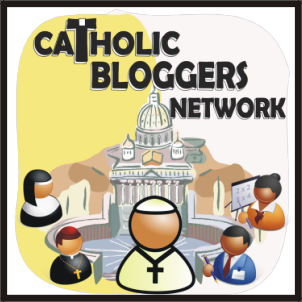 His spirituality, intended specifically to support those who live, breathe, and work in the media, is characterized by: Eucharistic prayer, integration (unity of life), and transformation in Christ: “For me, to live is Christ” (Phil. 1:21). The communications spirituality Alberione lived and passed on was definitively validated when he was beatified in 2003 by Pope Saint John Paul II. Today is the feast of one of my favorite saints, Elizabeth Ann Seton. She was a wife, mother, convert to Catholicism, and founder of a religious community, the Sisters of Charity. She was a society debutante as a young woman and later in life lived extreme poverty as she founded the Sisters of Charity. I’ve always loved the excerpts I’d read from her writings, but only when I was researching her life for my book, Saints Alive! The Faith Proclaimed, did I realize what a prolific writer she was. A woman of her time, Elizabeth didn’t publish her writings, but she wrote many, many letters, journaled, and wrote spiritual guidance for her sisters. From these come many spiritual gems, including one of my favorite adaptations of the Anima Christi prayer, which you can read here. Elizabeth’s life was filled with tremendous sorrow and loss—from troubles at home in her early life, to the death of her husband, to the loss of her children—only one survived her. Perhaps because of her sufferings, her writing style is warm, simple, and practical. I have found many spiritual gems in her writings. St. Elizabeth Ann Seton uses beautiful and understandable imagery to describe the spiritual life—not an easy thing to do. Her writings have recently become freely accessible in PDF. Although she is not listed as a patron for writers, I’ve added her to my list as a patron saint for my writing. I think she is a wonderful patron for those who write about spirituality, women writers, letter writers, and those who journal. 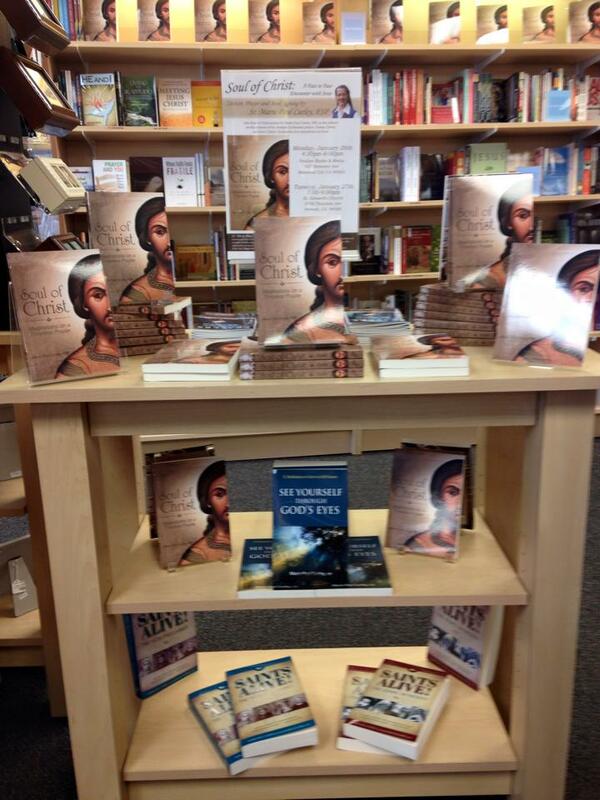 Discover the Treasure of Pauline Spirituality in NYC This Week! 1. 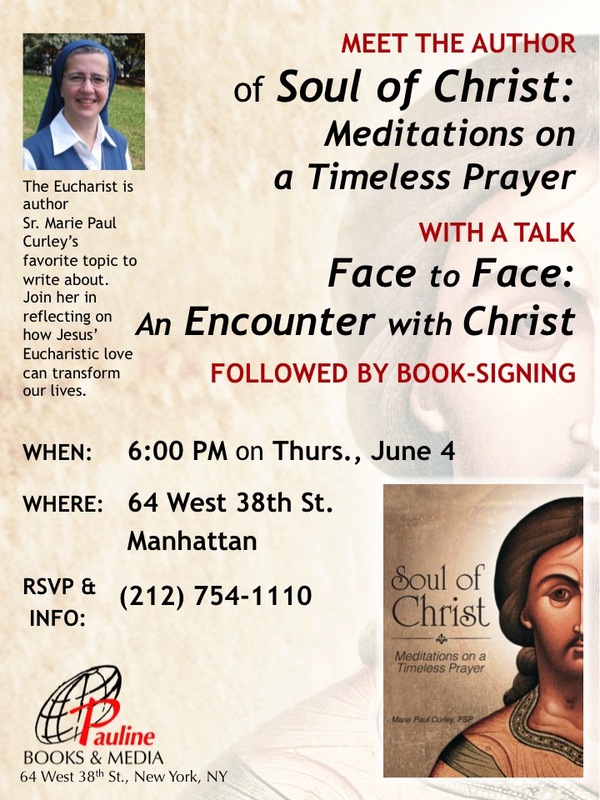 Manhattan’s very own #Soul of Christ talk and book-signing at our Pauline Book & Media Center at 64 West 38th St. on Thursday evening (June 4) at 6:00 PM. 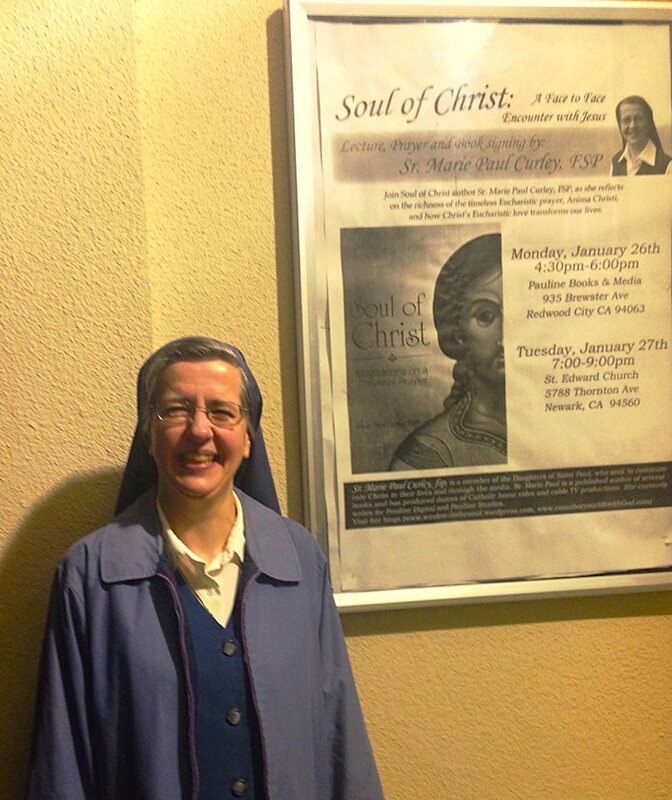 Lovely Review of Soul of Christ! 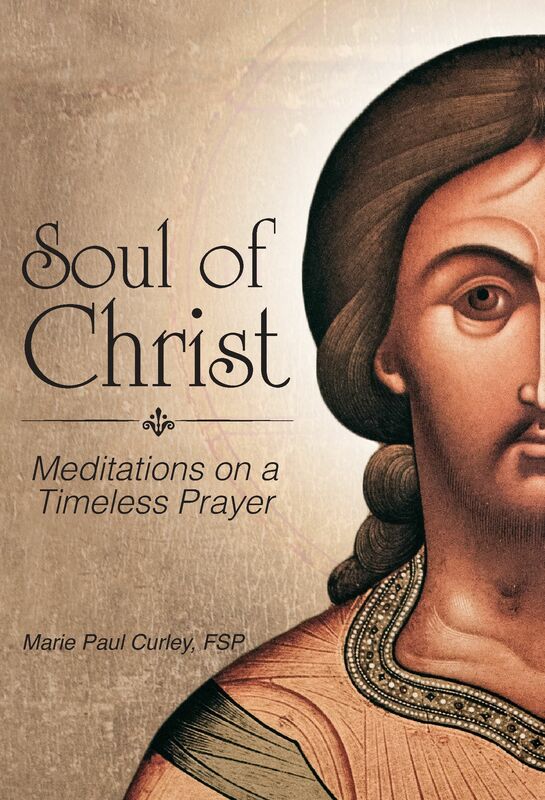 The first stage of my book tour for Soul of Christ: Meditations on a Timeless Prayer is now completed! Since November, I’ve been making frequent trips around the USA and Canada to our various Pauline Book & Media Centers: Toronto, Chicago, Redwood City, Los Angeles, San Diego, and Saint Louis. I should have kept a running count from my trips of all the people I’ve met who have read, are reading, or will soon read Soul of Christ, but it’s easily in the area of 500-600 people. In addition, I’ve tried to reach out through Catholic radio–and I’ve been impressed with the dedication of the Catholic radio producers that I’ve spoken with! 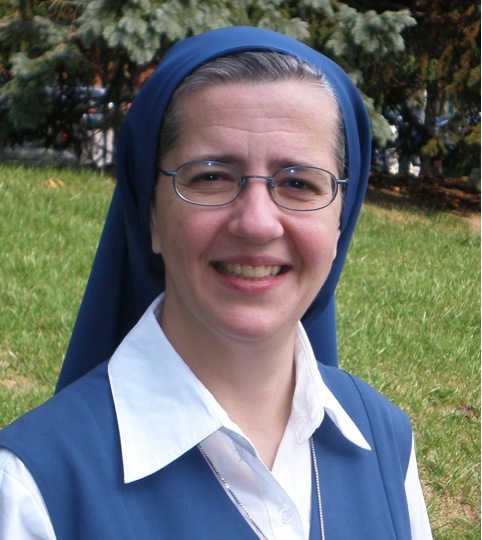 (Spirit Catholic Radio in Nebraska, Radio Maria’s Community in Concert in Toronto, Relevant Radio–both the Morning Air and Wendy Wiese’s On Call shows, Covenant Radio in St. Louis, and Salt + Light Radio). The entire experience has been filled with grace, as I’ve witnessed so many people’s tremendous love for our Eucharistic Lord, and their excitement to deepen their Eucharistic amazement and love with the Anima Christi (Soul of Christ prayer). The Goodreads Giveaway that I ran for one week back in February also worked out well, even with the confusion of the first three days where people couldn’t find the giveaway–looking for it on the wrong book. In the end, almost 400 people requested the book–and I had the joy of sending out the book to the three people who won! That was exciting, and I can’t wait to hear their feedback. For the next three months, I’ll focus on the apostolic writing I’ve let slide during my travels. My inner introvert is very happy about getting back to writing–rather than talking about writing! This also means that I can be more active online–blogging here at least once a week, more present on Twitter, etc. I’ve run into some good articles and resources on various aspects of writing, which I hope to share in the near future.